I thought it would be fun to take a look at some of the characters that have appeared in our games over recent years and how we’ve used them. Spooky Bonus was our successful match-3 game that came out in 2013 on casual portals (and later on Steam). There wasn’t a great deal of character interaction in this game, but it did feature this shopkeeper character, who pops up in dialogs. 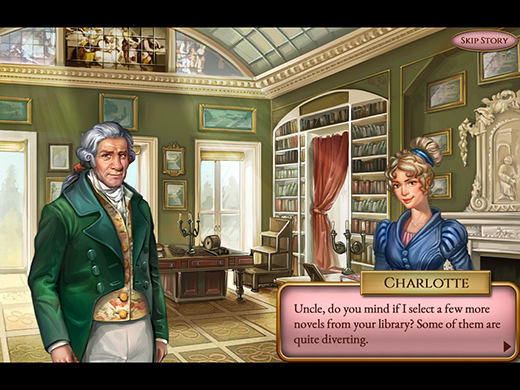 Our next game, Regency Solitaire had a visual novel element with slide-on characters and a protagonist that you can gradually ‘upgrade’ in terms of her costume and jewellery. 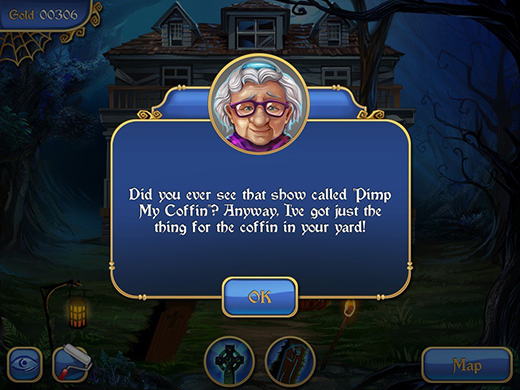 We put a lot of effort into researching historical clothing, hairstyles and so on for this game. 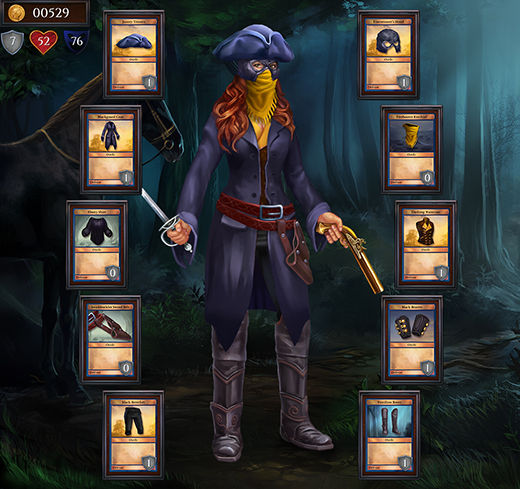 We took the customisable character to a new level with Shadowhand in 2017. 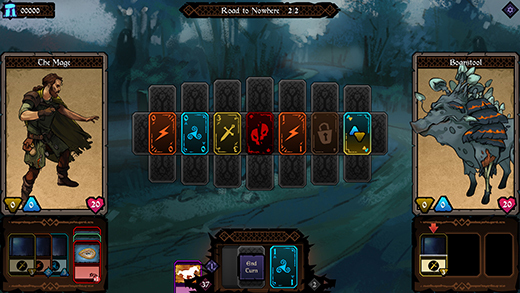 Our main character had a wide selection of clothing and weapon items, all of which affected gameplay. To make things more complicated, our character also had several different fight stances. This meant hundreds of pieces of art, and a lot of art direction. For all of these games we outsourced our art to RetroStyle Games. We think they did a really good job. For our latest project, Ancient Enemy, we have some new collaborators and have changed up the art style to suit the tone of the game. Our character artist is the talented Jen Pattison, and we have also had bold UI artwork from Dan Emmerson. We’ve been having a lively discussion today about character poses in games so we thought we’d share some of our experiences. You may find this instructive, or amusing, or both! 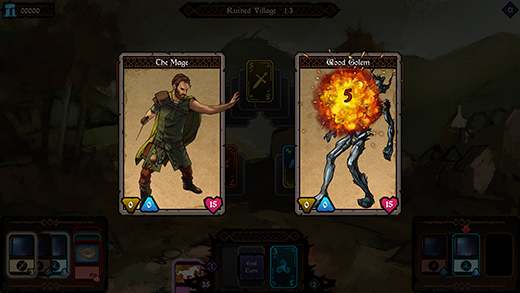 In our previous game Shadowhand, we went to a lot of trouble to get aspects of the stances as accurate and lifelike as we could. The types of thing we looked at were angles of limbs in active poses, hand grips on weapons, and scale. 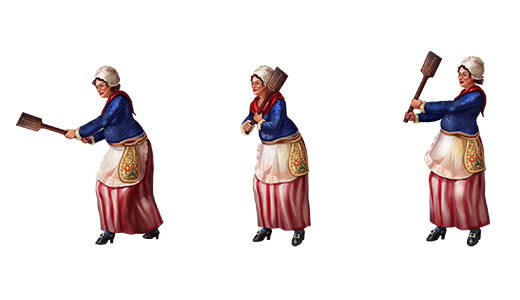 On our Watermill level, we have a Washerwoman character who battles the protagonist with a laundry bat. This was a kind of wooden paddle used in that time period (1770s) to beat and agitate laundry in large vats of water – thankfully most of us have washing machines that do this job today! 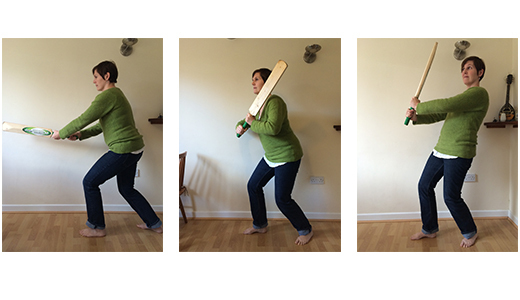 To get the pose and hand grip right, Helen posed with a cricket bat and we sent the images, along with detailed costume and character art references, to our artists at Retrostyle Games. The final character poses are below. Developers are willing to go to great lengths to make games! Our artist Jen is doing a great job on our fight stances for our next game, Ancient Enemy. Dynamic poses present some challenges but we think they really add a lot to the game! 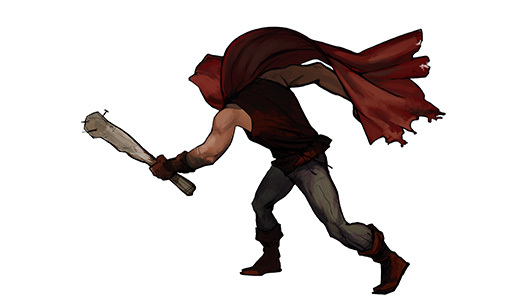 The overall visual design of the characters in Ancient Enemy is intended to follow the theme of the story that the world has seen a lot of conflict and everyone has mostly been left in tatters as a result, one way or another. That manifests in scruffy or damaged clothes; armour rusted, bloomed, or falling off; fungal growths; and in some cases people just being stitched back together to join the fight again. 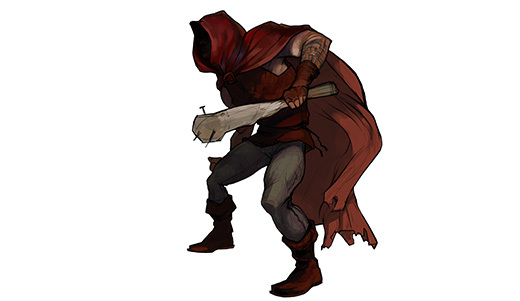 All the human characters are not quite human anymore, and the bandits are maybe the simplest expression of that by not having faces, just empty dark hoods like wraiths, but otherwise displaying the physically fit body type you might expect from their lifestyle. 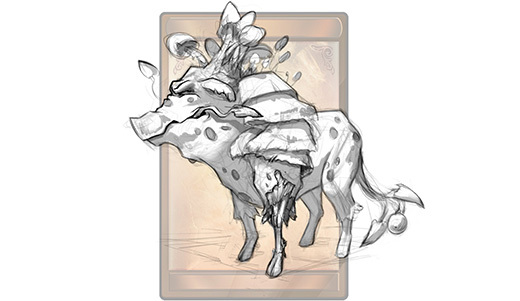 The Boarstool, on the other hand, is an example of warped nature, partly grown over and partly altered in fundamentals to be somewhere in the middle of plant and animal. We did a few iterations to get him a bit meaner and a bit more gross along the way, altering his expression and giving him a rotting leg. I also tried out a number of palette options for him, as some colours that could read as toxic/poisonous were also quite friendly/cute fantasy in tone. 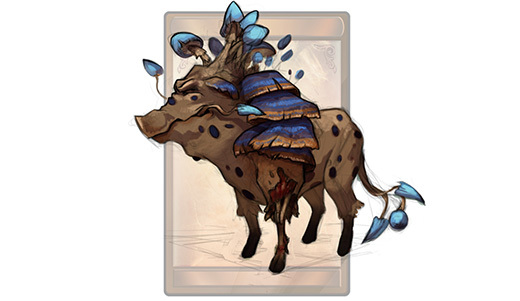 Ultimately we decided to have different colours of Boarstool in different areas of the game to add to the variety and to fit in with the mood of the zones where they appear. 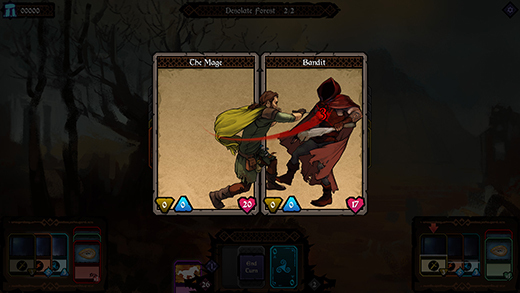 The aim for the characters’ stances was to create something dynamic and illustrative, within the limitations of the card based UI, which has taken a lot of back and forth to get right but it’s the sort of thing that’s very satisfying to work on as a team when it all finally comes together. You are currently browsing the archives for the Developer Diary category.